A quick note to recognize that a Coast Guard hero, with a bit of success in pro football, is to be honored. Thanks to James Vankoski for bringing this to my attention. a war hero and former NFL player and coach who hailed from Radnor, will be unveiled. The unveiling ceremony for the statue of Emlen Tunnell is getting near. The memory of Tunnell, the Radnor High All-Delco football player who saved a pair of lives while serving with the Coast Guard during World War II, will be honored when the statue is unveiled June 2. He was also the first African-American inducted into the Pro Football Hall of Fame following his NFL playing career with the New York Giants and Green Bay Packers and his work as an assistant coach with the Giants. 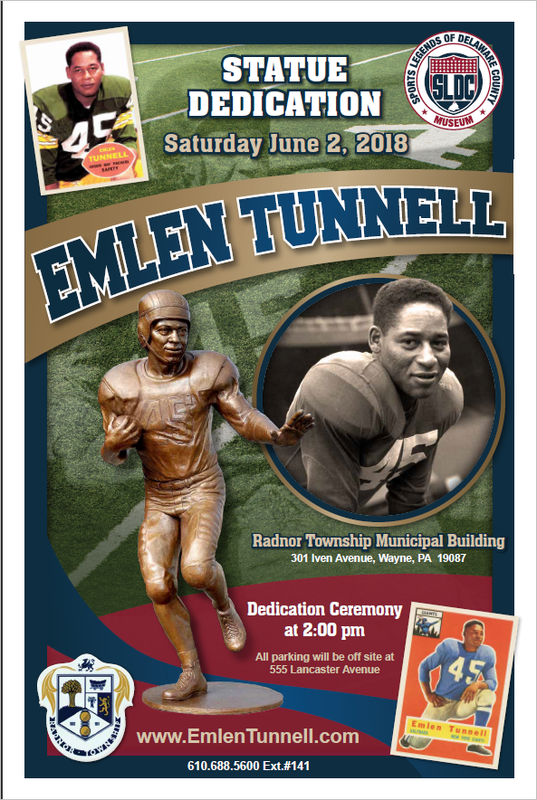 The statue will be placed outside the Sports Legends of Delaware County Museum at the Radnor Township Building on Iven Road. Museum curator Jim Vankoski has headed the statue planning committee, along with Phil Damiani of the Media Sports Hall of Fame and local sports historian Rich Pagano. Johnson was an All-Delco football player at Chichester High in 1969, joining five other future professional players on that All-Delco team: Monsignor Bonner’s John Cappelletti, the 1973 Heisman Trophy winner at Penn State who played for the Rams and Chargers; Haverford High’s Randy Grossman (four Super Bowl rings with the Pittsburgh Steelers) and Steve Joachim (tryouts with the Eagles and Baltimore Colts); Cardinal O’Hara’s Don Clune (New York Giants, Seattle Seahawks); and the late Chris Arnold of Darby Township High, who, after being cut by the NFL’s Oakland Raiders, played for the Birmingham Americans, 1974 champions of the World Football League in the one full season that league operated. Johnson was a Division III All-American and set a number of receiving and kick return records at Widener University, then was selected by the Houston Oilers in the 15th round of the 1974 NFL Draft. He returned five punts and two kickoffs for touchdowns in his first four years with the Oilers, was MVP of the 1975 Pro Bowl, in which he returned a punt 90 yards for a touchdown, and also played in the 1977 Pro Bowl. He became famous for his “funky chicken” end-zone celebration dances following touchdowns. Johnson was named the kick returner on the NFL’s All-75th Anniversary Team and remains the only member of that team who has not been elected to the Pro Football Hall to Fame. He also played for the NFL’s Atlanta Falcons and Washington Redskins as well as the Canadian Football League’s Montreal Alouettes. He has worked for the Falcons and has coached at Duluth (Georgia) High School.